· Modify some small bugs. · Update the EOP Follow Me style. · Fix some bugs of 1.0 version, and 1.0 version users need re-download and install the new version. 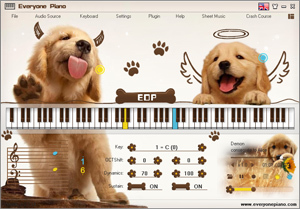 EOP MIDI Version is the forever free and super powerful piano learning software that is specially developed by EOP team , this software deletes the part of PC keyboard, while more stresses the control for MIDI. In a word, EOP MIDI Version is the essential software for learning the true piano. With the improvement of material culture and spiritual cultural, piano learning becomes chased by people. While the expensive piano, high-cost tuition fee and little-effect achievements make most of parents step back. For a long time, EOP team is aiming at the goal that "Make all people learn the piano with low cost", so we develop the EOP MIDI Version. As long as you have a MIDI keyboard, an electronic organ with MIDI port, a hand rolling piano or electric piano, they can all be connected to the EOP MIDI Version. Loading the world-best piano VSTi sound source, attaching abundant EOP teaching and assistant plugins, EOP MIDI Version enables you to breezily learn the piano at home. Parents do not get worried for ordering the several thousand dollars piano for their children. Only one MIDI keyboard you need order, then connect to the EOP MIDI Version, that's ok. Hundreds of dollars can handle the piano learning. 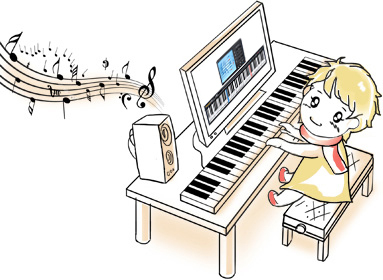 Meanwhile, the abundant stave resources, learning plugins and the children teaching video tutorials enable the piano learning to become energetic from passive. We firmly believe, the birth of EOP MIDI Version allows more and more people to fell the charming of music. • The essential software for learning the true piano. Hey there, I really like this program but I can&apos;t seem to get any VSTi extensions to work other than the ones that come with the program. I can select the ones I downloaded but when I play there is no sound. Thanks for making such great free software! First you need make sure the vsti sound is for 32 bit, since EOP is for 32 bit only. And then make sure the sound source had been installed in an right way, and if you are sure for the above things you can copy the dll to EOP VSTI fold to try. My Everyone Piano is being caught by antivirus. it says it has MalSign.Generic.FB4. each one of the softwares I try to install is being blocked. How can I fix this? In your youtube video, you show stave window instead of numbered. How to activate stave window ? Is it a plugin ? Hi, a very useful software ! cuando sale el plugin MIDI? how to convert EOP to Midi. Can we have view like synthesia. It is more easier. Notations are more easy to under stand. I'm sorry, only EOP files can be downloaded right now. We are developing new function that can change EOP file to midi file, but it is still being developed, and will be released later. how to convert *.eop to other formats like *.mp3...? When I start to install this the default installation destination is the same as the program Everyone Piano. Should I leave it like that and install both on the same folder (C:\Program Files (x86)\EveryonePiano)? Thank you for your support and please install both on the same folder. i cannot used the pc keypad it doest work,.. but the mouse does. why is that?? your the best EP,..thanks a lot! Would you please specify your problem? Or send the screenshot to email support support@everyonepiano.org? Hi! which program must I use to open the archive EOP MIDI? Please download the EOP Midi program above and follow the hints to install it, then you can open it. Please Update This Software....& One Request....Add Play Piano From Mic or Line in Cable....I Mean Add Direct (Wave) Sound Playing System....Plzz Plzz Plzz :) THANK YOU FOR THIS BEST SOFTWARE. Thank you very much for your suggestion. We will add it in the future. Anychance convert eop to midi ? Thanks EP.. ur the best. Sorry, not now. But we will add this feature in the future. Sorry, not now. But in the future we will add this feature. Can I open midi files (.mid) with this software? Just want to verify that the MIDI EOP is all I need for my digital keyboard. I don't have to download EOP first? 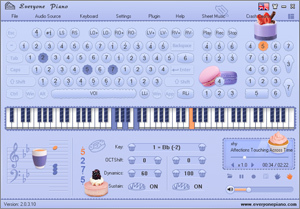 EOP midi is the program to be used to play piano on your PC while EOP is the music file for listening each piano.You can download any EOP for your favorite piano sheet on everyonepiano.com.